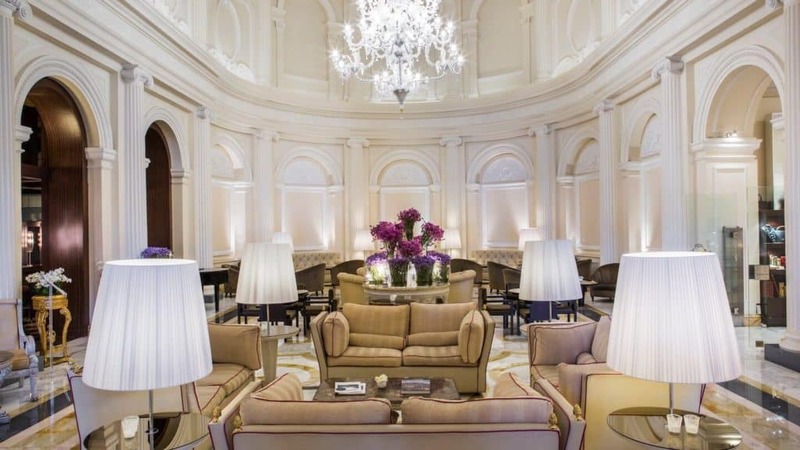 For its majesty, Palazzo Naiadi exceeds the simple definition of a 5-Star Luxury Hotel. 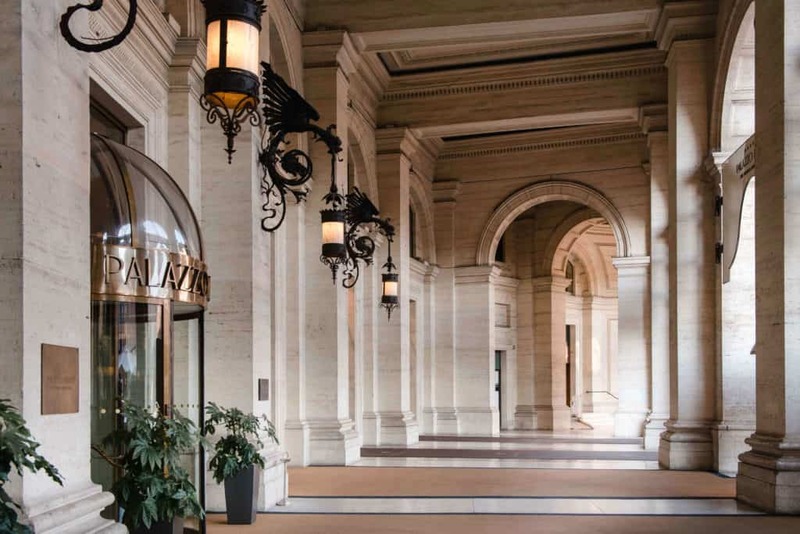 The hotel is perfectly located in the center of Rome, on the curve of Piazza Repubblica. History is everywhere, but so is the fun of being alive in Rome – and we want you to enjoy it. 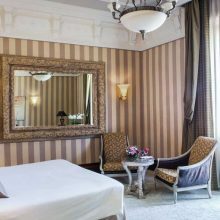 The beautiful rooms and suites have been designed in neoclassical style in elegant shades of new and old gold, surrounded by silk wall hangings, rich brocade curtains, inlaid furniture and accents of gilt and bronze. All our rooms come with complimentary Wi-Fi. 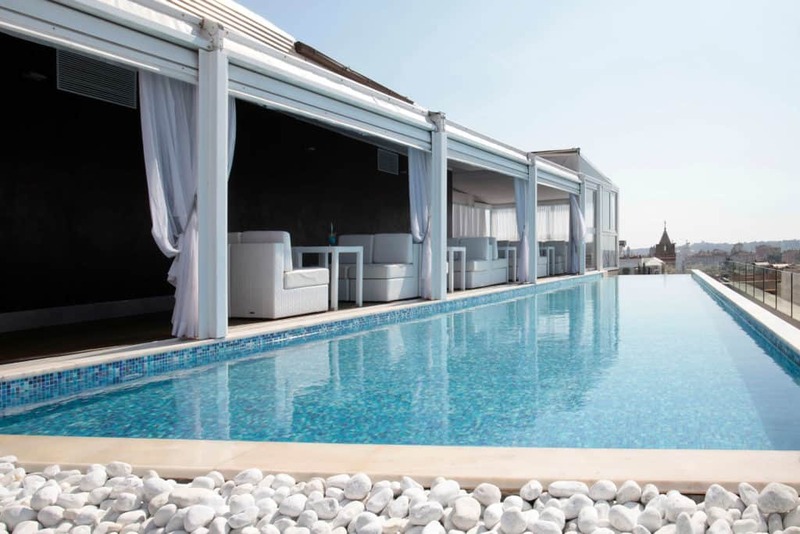 Come up to the rooftop pool where you can gaze at the magnificent views of Rome. Step into the intimate, tranquil haven of the Fusion Spa, and prepare to rebalance your body and mind. 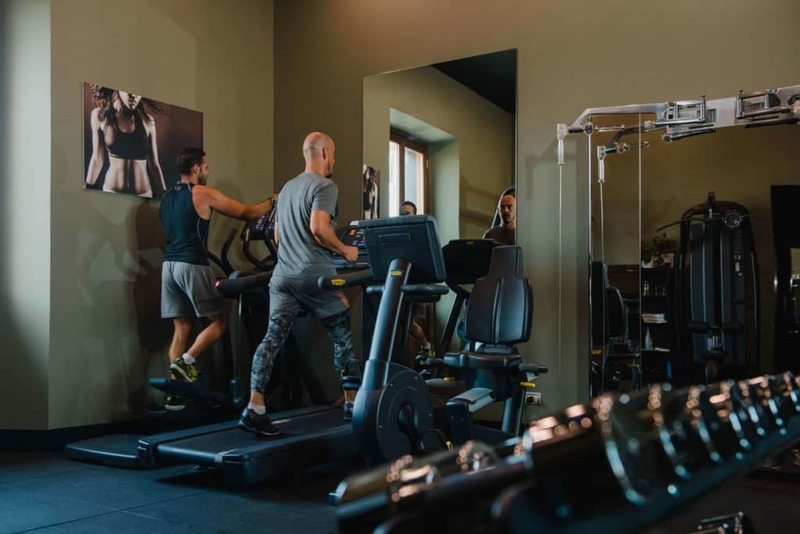 Alongside the six treatment rooms, beauty station, steam room and Jacuzzi, the fitness room has the essential latest-generation Technogym equipment. The award-winning chefs of the hotel and service-oriented banquet staff will be working in concert with our own fantastic kosher chefs. They will create a fabulous culinary experience drawing from the best of Italian, continental and traditional Jewish fare under the Glatt Kosher Supervision of Rabbi G.M. Garelik, the most well-known hashgacha in Italy. Our daily religious services along with thought provoking lectures and discussions, children’s program, plus exciting optional sightseeing tours will round out a truly unique Pesach experience. Our esteemed Scholar-in-Residence will be Rabbi Lord Jonathan Sacks, Member of Parliament of the United Kingdom. Neo classical style room in nuances of beige. 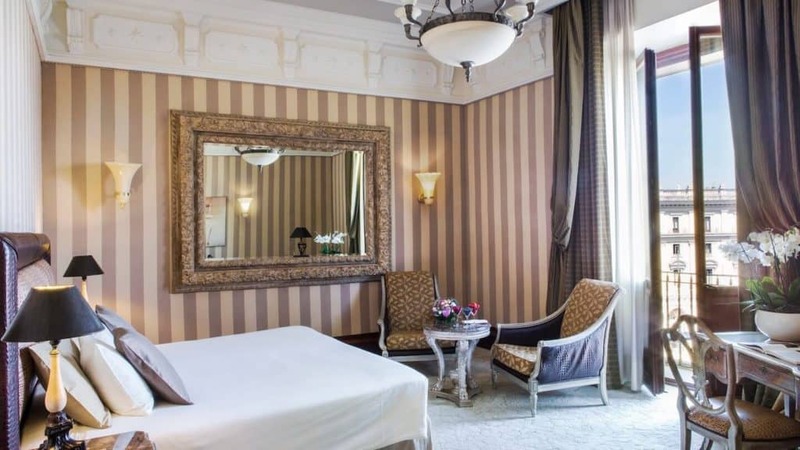 Large spacious room in the neo classical style, large marble bathroom. 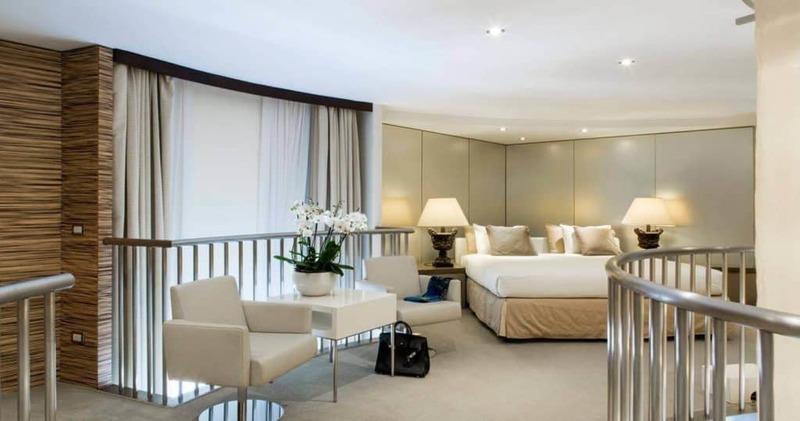 Ultra spacious rooms with a sitting area gives these elegant neo classical rooms added appeal. Panaromic view over Piazza della Repubblica. Gives these neo classical elegant rooms it’s charm. DUPLEX Jr. Suite 614 sq. ft.
An elegant living space at the entrance and an intimate loft sleeping area make up a refined space on two levels. 260 sq. ft. Neo classical style room in nuances of beige. 355 sq. 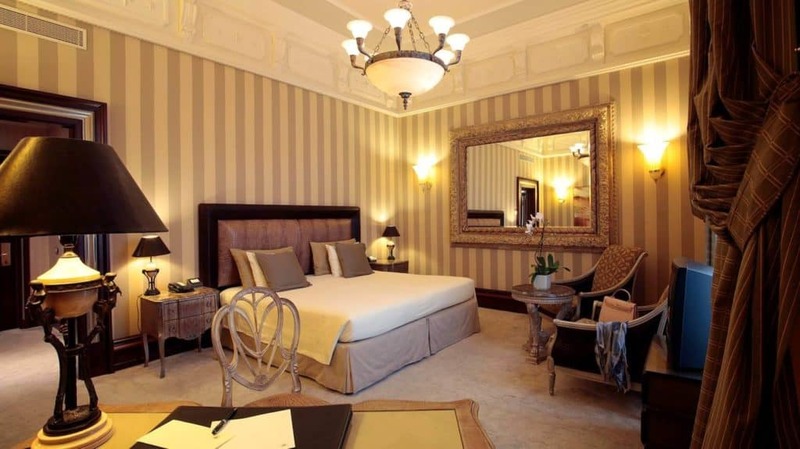 ft. Large spacious room in the neo classical style, large marble bathroom. 485 sq. 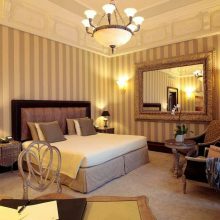 ft. Ultra spacious rooms with a sitting area gives these elegant neo classical rooms added appeal. 485 sq. ft. Panaromic view over Piazza della Repubblica. Gives these neo classical elegant rooms it’s charm. 614 sq. ft. An elegant living space at the entrance and an intimate loft sleeping area make up a refined space on two levels. 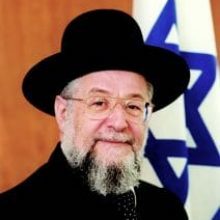 Rabbi Yisrael Meir Lau is Chief Rabbi of Tel Aviv. He had previously served in this position from 1985 until 1993. At that time, he was appointed Ashkenazi Chief Rabbi of Israel, a position which he held until 2003. Rabbi Lau currently serves as chairman of the Yad Vashem Council. Rabbi Lau, a survivor of the Buchenwald concentration camp, immigrated to Israel with his brother Naphtali in July 1945 and was ordained a rabbi in 1971. He served as chief rabbi in Netanya (1978-1988), and earned a reputation as a popular orator. In 2000, he wrote a best-selling memoir about his experiences in the Holocaust entitled Do Not Raise Your Hand Against the Boy, which won the Israel Prize for life-work. The book has since been translated into English and published as Out of the Depths: The Story of a Chidl of Buchenwald Who Returned Home at Last. Rabbi Lau and Rebbetzin Chayita (nee Frankel) are the parents of three sons and five daughters. Yossi Fachler is a UK born natural people’s man. He graduated from College in Jerusalem and has been living in London since 1991 with his wife Sarah, and two children where he became youth Minister in two central London Synagogues. 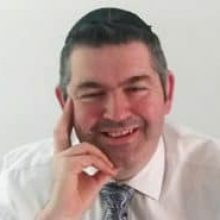 Since then, Yossi’s services are used on a bi-monthly basis by the United Synagogue Community Division and the Office Of The Chief Rabbi to take the Shabbat Services around the UK communities, giving the sermons, blending in his famous sense of humor and topped off with his beautiful davening voice. Since then, he has subsequently presided over the high holidays all over the world, including three years at the Saatchi Synagogue, St John’s Wood, South Hampstead, North Brook Illinois, St Albans, Glasgow, Birmingham, Radlett, Cardiff and Hendon – where he takes the services in davening and sermons. In 2005, and again in 2015, Yossi successfully promoted the ’60 days for 60 years’ and ’70 days for 70 years’ projects to over 250,000 members of the Jewish community around the world. In his spare time, Yossi gives evening lectures around the UK, to business people, lay people and high school students alike. Over the last 20 years the name Ari Greene has become synonymous with quality Jewish music. As musical director for Barock Orchestra, he is driven by his passion for all styles of music and his understanding of the integral role that Jewish music plays in all celebratory and ritual settings. In college he studied at Yeshiva University’s Belz School of Music, and today he is a much sought after ba’altefila, known for his fidelity to nusach as well as his knowledge of contemporary Jewish music trends. In addition to his impressive musical resumé, Ari is currently associate director of admissions for Yeshiva University, where he helps shape the lives of the next generation of Jewish leadership. For the past decade, Ari and Robby have teamed up to provide music of all kinds at Passover programs and special events around the globe. A Long Island native, Lauren grew up in Oceanside, NY, where she studied at the Oceanside Conservatory of Dance. Lauren is a certified Zumba/Zumba Kids fitness instructor and especially loves teaching hip-hop and musical theater jazz styles to kids of all ages. 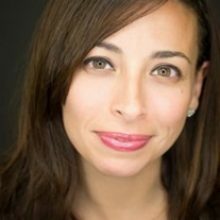 Lauren currently teaches youth, teen and adult dance and dance fitness classes at Progressive Dance studio in Englewood NJ. Her bright smile and warm, bubbly personality make Lauren’s classes consistently fun.Lauren’s positive energy is contagious and she can’t wait to bring it to Pesach!!! She is super excited to combine her passion for dance in Italy — the place to be! As a well trained Ba’alTefilah, musician and recording artist, Michael Nadata has served and musically entertained Jewish communities throughout North America and Canada for nearly two decades. 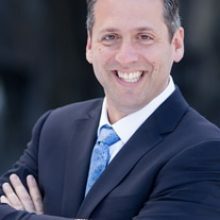 While studying for Semicah in Yeshiva University, Michael fine tuned his Nusach in the Belz School of Music and trained to master the art of singing with several voice coaches in the tri-state area and Vancouver B.C. 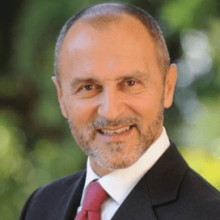 He has served many communities for over 10 years as Ba’alTefilah for YomimNoraim, in addition to the largest known Orthodox Shul in Western Canada in Vancouver B.C. 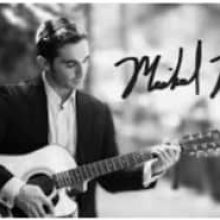 Michael’s progressive sounds and soulful vocals will meet you where you are at and take you to the place you want to be. Michael is a true renaissance man, both an educator and an artist. Currently serving as musical director of The Moriah School in Englewood, NJ, he drives his students for excellence in all genres of music and to appreciate the narrative behind the artist and pieces they are studying. After school hours, Michael gives voice, piano, guitar, studio recording, bar and bat mitzvah lessons. In addition, Michael has coordinated the music for the Central East NCSY region for the past 16 years. Montitour will be handling airport transfers and all group tours for our Passover guests. In order to better serve you, please reserve in advance all your transfers and tours. Silvana, will be the contact person for your airport transfers and touring needs. She speaks English fluently See below her contact information. Montitour offers all types of services including group tours (see below) private transfers and private tours anywhere you want. All payments are made directly to Montitour through Credit Card, PayPal or through bank wire transfer. Depart: 8:00 a.m. – Return: 8:30 p.m. The excavations of Pompeii are extraordinary material evidence of the ancient world, thanks to the state of preservation of the city, which remained practically intact after the eruption of 79 A.D., erased it from the Vesuvian landscape. Pompeii is a unique example of a typical Roman city with its villas, homes, temples, the forum, the theater and spas. Most of the city was brought back to life with appropriate excavation and thanks to this, it is now possible to reconstruct with certainty the organizational life of the ancient Romans, their uses and their customs. A truly amazing place, and a must to visit. At the end of the visit, we continue by bus towards the Vesuvius, the volcano in which, with its eruption, buried the towns of Pompeii and Ercolano. Arriving at the main square, we continue by foot to the ridge of the crater (approx. 30 minute walk). During the visit you will be accompanied by and expert guide. We advise you to wear suitable and comfortable shoes suited to walk the streets of Pompeii and the paths up the mountain which reaches 1000m above sea level, as well as sun glasses, binoculars and your cameras. Depart: 9:30 a.m. – Return: 5:30 p.m.
You will discover how the small Jewish community of Rome survived and still thrives after 22 centuries. The “Teatro Marcello” and the “Portico d’Ottavia” are some of the stops on the streets of the Jewish Ghetto, one of the oldest Jewish communities on the Western Mediterranean. The main Piazza in the Jewish quarter has been considered the main meeting point for the Jewish people over the ages. 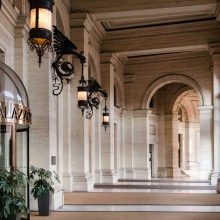 At the end of this visit, you will be taken on a walk through the streets of Rome, through the most significant scenic accommodations, including places of ancient memories and solutions of modern town planning. The tour begins at “Piazza Navona” and continues to the “Pantheon”. You will be accompanied to the discovery of famous and fascinating sites: squares, fountains and historical churches. 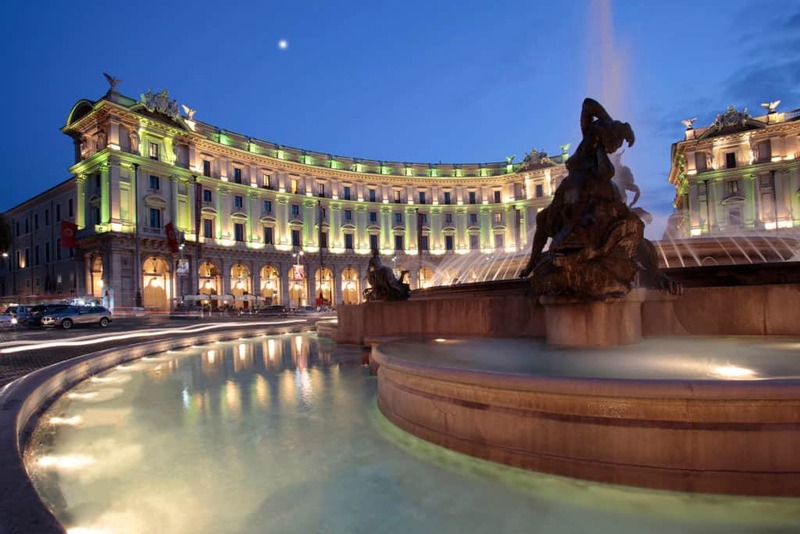 We will cross “Piazza Colonna” and the “Corso”, to reach the Trevi Fountain. How can you not to throw a coin into the water to make a wish? Then a walk up to the Spanish Steps to admire the “Barcaccia” and “Trinitàdei Monti”. The scenic tour of the beautiful Campania coast line will take you to those wonderful places that inspired the great Caruso and the birthplace of Torquato Tasso. We will go through: Sorrento, Positano, Ravello, Vietrisul Mare, etc. with stops in Conca dei Marini to visit the “Emerald Cave” and Amalfi (the Sant’Andrea Cathedral, an extraordinary example of architecture in the Arab-Norman style). Meet with your guide and start the tour of the Amalfi Coast. Panoramic stop at Belvedere “Madonna” (parking space permitting) to admire the village of Positano from above crossing the villages of Praiano and Furore. Stop in Conca dei Marini to see the famous Emerald Cave. Continue to Amalfi, stop and visit the monumental complex of St. Andrew: Paradise Cloister, the Crypt and the Basilica. Continue to Ravello and visit Villa Rufolowith with its large terrace on the beautiful Costa. 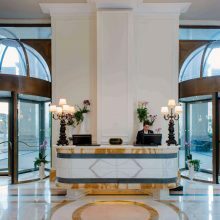 Depart: 6:30 a.m. – Return: 9:00 p.m.
We departure from Palazzo Naiadi at 6:30am arriving at the Port of Naples at 9:00a.m. We then depart at 9:30a.m for Capri in a hydrofoil. After arriving in Capri, we will meet with the guide and depart by bus for the island tour. We arrive at Anacapri, a town located on the top of the island, at the foot of Mount Solaro and visit Villa San Michele, the ancient residence of Axel Munthe. The Swedish doctor came to Capri in 1885 and had his residence built on the remains of an ancient chapel dedicated to San Michele. Today the villa is a museum house full of historical finds: sarcophagi, busts, Roman pavements, marbles and columns, and one of the most beautiful Gardens of Italy with plants and flowers from all over the world. Afterwards, weather permitting, we will visit the “GrottaAzzurra” or Blue Grotto (optional visit). 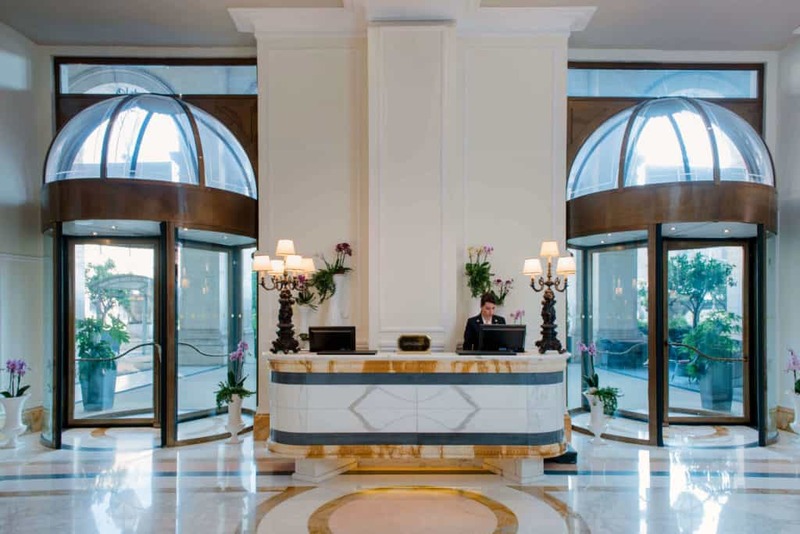 We will then continue to the Piazzetta or square of Capri, the lounge of the world and Via Camerelle, the shopping street where you can buy handmade Caprese sandals and Capri’s famous perfumes. Via Camerelle leads to the Gardens of Augusto, a set of flowered terraces overlooking the Faraglioni, the famous rock arches in the sea, and the bay of Marina Piccola. We return to the Piazzetta of Capri in the afternoon, on board the characteristic Funicular, in which you will descend for a few minute ride back to the port, you will go back to the hydrofoil for Naples (now scheduled for 5:25pm). 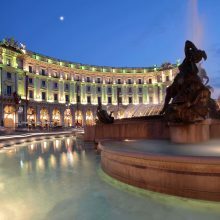 At 6:25 p.m. we will arrive in Naples and return back to Rome by bus where we plan to arrive at approximately 9:00pm. Depart: 9:30 a.m. – Return: 6:00 p.m. Discover your favorite labels at prices from 30% to 70% off through out the year. At Castel Romano Designer Outlet there is always something special for everyone: the splendid architectural setting, bars and restaurants and more than 140 shops. 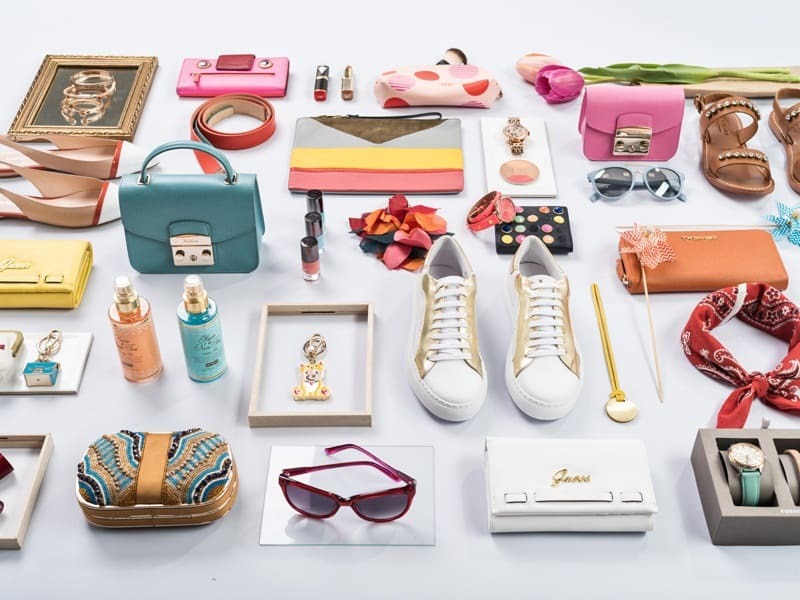 You’ll find big names including Versace, Valentino, Gucci, Fendi, Roberto Cavalli and Michael Kors, sportswear brands such as Nike and Adidas, and many other major fashion brands such as Guess and Diesel. Depart: 8:30 a.m. – Return: 9:00 p.m. Depart from Rome Termini train station by high velocity train to Florence with an expected arrival of 10:30a.m. 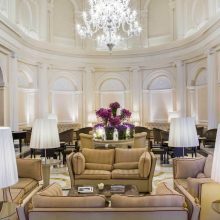 After exiting the Florence train Station, we will be accompanied by an expert guide who will guide us on a 10 minute walk to Piazza del Duomo, one of the most elegant streets of Florence. Here, we can admire the Cathedral of Santa Maria del Fiore, one of the most beautiful and biggest European cathedrals, with its characteristic facade and dome made by Brunelleschi. In front of the Cathedral is the Baptistery of St. John and next to the Duomo, the Bell Tower of Giotto. (This only includes external visits). From Piazza del Duomo, we will continue in Via dei Calzaiuoli to reach Piazza della Signoria. Here you will find the Fountain of Neptune, David of Michelangelo (copy), Palazzo Vecchio and the Loggia deiLanzi. Within walking distance is the Galleria degli Uffizi (Uffizi Museum) where important masterpieces of Italian art are preserved, including many Renaissance works such as “The Birth of Venus” and “Spring” by Botticelli. We will enter the Gallery for a brief guided tour. After a short break for lunch, we will cross Ponte Vecchio, a symbol of the city from which you will be able to observe the old goldsmith shops and jewelry showcases. At the end of the visit, you will return to the train station for your return to Rome. Depart: 8:00 a.m. – Return: 6:00 p.m. The Royal Palace of Caserta was built in 1752 by Luigi Vanvitelli at the request of the King of Naples, Carlo di Borbone or Charles of Bourbon with the purpose to build it as the fulcrum of the new kingdom of Naples. The intent was to build something that could not only stand up to the Palace of Versailles, but even overcome it in majesty. In 1997 The Royal Palace of Caserta was declared a UNESCO World Heritage Site, along with the complex of San Leucio. The Palace consists of an area of 47,000 m2, five floors and four interior courtyards. It has within it a majestic grand staircase, the Palatine Chapel, the historic building, the theatre of the court and the Picture Gallery. The park and the waterfall, also give the complex a highly elegant and scenic resolution.The visit continues in the village of San Leucio, home of the Silk Museum which consists of the school, home of the parish priest, workshops for spinning and twisting silk, the room for weaving and for dyeing, the hall of frames and the Royal apartment. The factory was enlarged with the construction of the Spinning Mill of Cypresses and in 1823, the Coculliera for the storage and preparation of silk worms waiting for reeling. You will also visit the Royal apartment where you can admire a series of rooms including numerous machines and equipment of the era used in the different stages of silk processing and the “House of the Weaver”, a typical home of the Luciano worker of the 1800’s. At the end of the tour, you can browse and shop in several of the village shops. depart: 9:30 a.m. – return: 6:30 p.m. 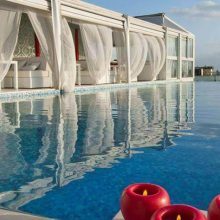 Departing the hotel and you can reach the Azienda Agricola Cantine Sant’Andrea in Borgo Vodice, near Terracina, on the Lazio coast. 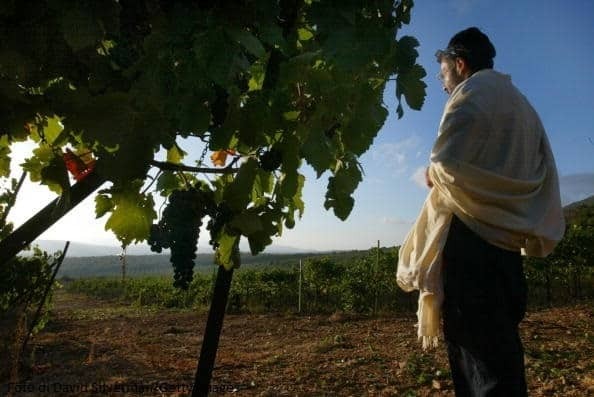 The tour will begin upon your arrival at the winery admiring all the necessary steps of producing kosher wine. The tour lasts approximately 2 hours and includes: Guided tour of the vineyards, the wine cellar and wine tasting. The wine tasting will include 3 wines: Kosher dry white wine Pinot Grigio; Kosher dry red wine Cabernet Sauvignon; Sweet Kosher white wine Moscato. During the wine tasting it is possible to eat the meal provided by the hotel. At the end, if time permits, take a short walk along the seafront and return to the hotel. Depart: 9:30 a.m. – Return: 4:30 p.m.
Eternal city, capital of Italy, Roma is also named “caput mundi”. Panoramic tour in the center of the city: Stazione Termini, Piazza della Repubblica, Piazza Venezia, Campidoglio, Boccadella Verità, Circo Massimo, and the Colosseo. In the morning, the tour includes visiting the Colosseum and the Roman Forum, meeting with your guide outside the monument and an initial explanation of the Valley of the Colosseum and the archaeological centre. The course is aimed at identifying the main aspects of public life in the heart of the ancient city, from the age of the directing Empire. A careful analysis of the buildings will reveal the functions and all the activities that took place there: the Colosseum, the monumental setting of spectacular fights between gladiators and fairs; the Roman Forum, the centre of judicial, commercial, political and sacral. The excursion includes a visit to Villa D’Este, a mansion built upon the request of Cardinal Ippolito II D’Este. The life in this villa was a very active one in the mid 1500’s. It was a destination for many famous people. It has beautiful frescoed halls, but the main attraction consists of it’s beautiful and original gardens with numerous fountains of incomparable beauty and majesty. Among these, the Fontana dell’Organo, La Rometta, and il Viale delle Cento Fontane, a pathway with one hundred fountains. Upon finishing the tour, transfer by bus to Villa Adriana. The Emperor Hadrian built this country villa for himself and his court and it bears unique testimony to the grandeur and architectural and decorative characteristics of the period. Today it exists as an immense park, extending over 80 hectares and dotted with several Roman ruins as well as spas and houses from the 1700’s and all set in an environment charged with ancient fascination. The grounds also contain the “Teatro Marittimo”, an artificial island which was a private residence of the Emperor as well as other interesting locations such as “Canopo”, a huge rectangular pool encircled by sculptures which recall the Serapeo. Ongoing excavations have brought to light an intricate system of roads which lead to the imperial residence. The responsibility of the Agency is governed by the following conditions and Legislative Decree 111/95 implementing Directive 90/314 / EC. The conditions described below are an integral part of the travel contract concluded between the participant and the organizing agency. This contract binds the Customer from the moment of final registration of the tours, as well as the Agency. Registration of the tours will be accepted up to the point where all seats for each coach or minibus have been reserved. In order to adequately prepare for visits planned to the archaeological sites, museums and places indicated. Any bookings made after that date will be accepted subject to availability of seats on bus, services and entrance tickets to museums and archaeological sights. The program may be subject to adjustment if unforeseen needs make it necessary. Montitour reserves the right to cancel the tours, at any time prior to departure, with the only obligation of the restitution of the amount collected. The execution of the excursion is subject to the provision of a minimum number of participants fixed at 25 participants. The registered participant who decides to no longer take part of the tour, must give notice to Montitour by April 18th 2019, obtaining full refund of the amount paid. No compensation will be granted to those who do not participate in the trip without notice in the manner described above or who give up part of the tour which has already begun. The Agency cannot be held liable for any delays, road interruption, traffic, mechanical failures, strikes, damage or theft of personal belongings or objects forgotten on the means of transport used, and of possible closure or restoration of museums, monuments, etc. Montitour is authorized by deliberation n.2079 28/04/87 of Region of Lazio. Just 30 minutes far from Fiuggi there is Subiaco, a magical place where nature and culture meet. Subiaco is a popular destination for lovers of outdoor sports and culture: it is set in the grassy uplands of the Simbruini Natural Park, where it is possible to come in contact with the reality of the fauna of the area, admire the green valleys, high peaks, beautiful views and interesting mountain villages. Vivere l’Aniene offers many outdoor activities and cultural tours suitable for families, to make the holiday in Italy an unforgettable experience. In a day you can explore forests and canyons, sail down the Aniene river, visit places rich with history and culture, taste the dishes of our local cuisine. Check out our calendar activities and find great things to do during your holiday! Depart: 8:30 a.m. – Return: 7:00 p.m. In the morning you will enjoy soft rafting in the Aniene River, discovering all of the wonders of the valley and the city of Subiaco. The Aniene River, characterized by its crystal clear and fast-running waters, will give you a thrilling experience full of adventure and enchanting scenery, all in total safety. 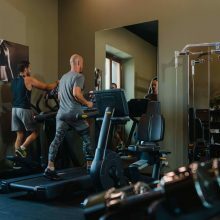 Vivere l’Aniene will provide you with all of the equipment for the activity. In the afternoon you will enjoy a relaxing and pleasant excursion in the nature with expert trekking guides, to discover the wonderful beach-forest and geological features of the karst highland. Soft rafting and hiking are suitable for all ages and are ideal for families. The children will have the time of their lives experiencing the thrills of true explorers… and the adults will rediscover that childhood excitement! Equipment: Sport clothes, trekking or trail shoes, k-way. Please remember to bring with you a change of clothes shoes included. Depart: 8.30 a.m. – Return: 7.00 p.m.
– Canyoning (25 people max. ): a high impact emotional excursion, in which you will visit internal clefts and canyons. Incredible turquoise water, deep puddles for diving, water chutes, and little descents under natural arches. And, at the end, a beautiful lake where spend a funny day with the whole family. Vivere l’Aniene will provide you with all of the equipment for the activity. – Orienteering (100 people max. ): learning how to read a map and how to use a compass to discover nature and reach the goal! We will enjoy the excursion with orienteering games and challenging demonstration with map and compass, looking for your best way. In the afternoon we will visit the Museum of handmade Paper Borgo dei Cartai, to discover how papermakers produced paper in ancient mills many centuries ago. The museum, divided into various sections, illustrates the historical phases of the processing of paper with equipment, documents and old instruments. Canyoning Equipment: Sport clothes and a swimsuit. Please remember to bring with you a change of clothes, shoes and underwear. Orienteering Equipment: Sport clothes, trekking or trail shoes, k-way. Depart: 8.30 a.m. – Return: 12.00 a.m. In the morning we will discover the wonders of nature learning how to read a map and how to use a compass. We will enjoy the excursion with orienteering games and challenging demonstration with map and compass, looking for your best way. Personalized routes for all levels, including options for children to ensure fun for everyone. Vivere l’Aniene will provide you with all of the equipment for the activity. Soft rafting and orienteering are suitable for all ages and are ideal for families. The children will have the time of their lives experiencing the thrills of true explorers… and the adults will rediscover that childhood excitement! Equipment: Sport clothes, trekking or trail shoes, k-way. Please remember to bring with you a change of clothes, shoes included.